Skillful means is one of the great wisdom teachings of Mahayana Buddhism and Zen. It is the merging of compassion with deep wisdom which allows us to receive the teachings and practice skillfully, so that we can free ourselves of binding attachments and false views. It is also how we manifest compassion towards others. Skillful means are neither abstract nor conceptual, but are earthy in their direct and immediate application. They allow us to more effectively practice and free ourselves on the path of practice-realization, and to help others in their own lives without arrogance or disempowerment. The moral Precepts – shila – are some of the most accessible and profound teachings of Mahayana Buddhism. They help guide us in the path of awakening to selfless wisdom and compassion, and teach us how to be more generous in our thoughts, words and actions towards every being and the world. In this retreat, we’ll blend periods of zazen and discussions to help us understand the essential teachings of arousing aspiration, taking refuge, atonement, karma, and compassionate action. We’ll concentrate on how these teachings support and motivate our meditation practice, and how supremely relevant and timely they are in our everyday lives of relationships, work, social action and spiritual practice. This is an excellent opportunity to study with Shugen Sensei and benefit from the sangha, to deepen your practice and gain strength for your everyday practice at home and in the 'field'. Whether you have been practicing the Precepts for many years or are new to these teachings, this workshop will help us to gain fresh perspectives so that the Precepts can help us to live more freely, rather than confine us. 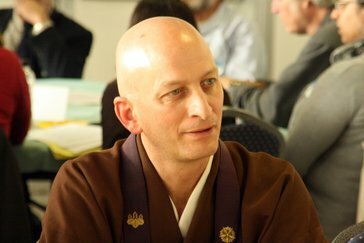 Geoffrey Shugen Arnold, Sensei is the Head of the Mountains and Rivers Order, abbot and resident teacher of Zen Mountain Monastery, and abbot of the Zen Center of New York City. Shugen Sensei has been in full-time residential zen training since 1986; he received dharma transmission from Daido Roshi in 1997. He has visited New Zealand to lead Zen Buddhist retreats and workshops for many years, and currently offers a programme in Nelson each July. Early-bird rates are for those who have completed registration and payment by 9pm Monday, June 19, 2017.